Pakoon 2 Game - Download and Play Free Version! 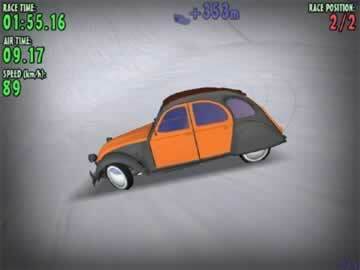 Roll Downhill at Unsafe Speeds in this Challenging Stunt Racer! There’s nothing quite like being up at the top of a high mountain. The entire world becomes a splendor for your eyes, the wind blows unobstructed on your face, and a feeling of triumph can permeate throughout your very being at having conquered such a steep climb. Perhaps the greatest thing about being so high up is the feeling you can get running back down; the descent is always easier than the ascent after all. Unfortunately, that’s not always the safest option to take, but safety is the last thing you’ll need to worry about in Downhill Pakoon 2. Downhill racing is the name of the game in Downhill Pakoon 2. You’ll drive down a variety of mountainous terrains at extremely high speeds, ramping up steep hills and making a variety of daring leaps of faith. Fasten your seatbelts; you’re in for a wild ride! Roll down mountains all across the globe! Try your luck in Brazil’s Japura, Russia’s Kikiakki, or in the Sabrina Coast of Antarctica. 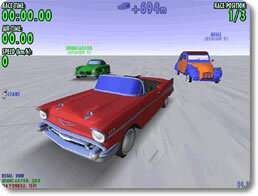 Drive your choice of seven vehicles, including a 1957 Chevrolet, stylish Lamborghini, and a heavy-duty truck. Play three different types of games. Race against the clock in Speedrace mode, be sure to hit every pole in Salome mode, and see how long you can go flying in Airtime mode! Watch the action unfold with four different kinds of cameras. Race to the Bottom Against Other Players! The single player mode is crazy as it is, but if you really want to see what kind of insanity is possible in Downhill Pakoon 2, then you need to go online to try your hand against other players. Become a client and hop onto any available servers. Set your own rules quickly and easily by putting up your own server. Join an in-progress game at any point in time. Downhill Pakoon 2 offers plenty of thrills for the action junkie in all of us, but that’s not all it has going for it. The game’s source code is completely open source and freely available to the public! If you have even an ounce of creativity in you, feel free to crack open the code to create your own levels, cars and whatever else you like. Share your creations with the world! Downhill Pakoon 2 is a highly addictive and fast-paced action title that you’ll have a hard time putting down. There’s always one more jump to make, one more second to shave off your record, and one more human opponent out there who’s ready to eat your dust. There’s a lot to offer and all of it is completely free. 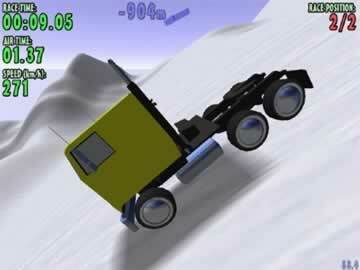 Play Downhill Pakoon 2; it’s a safe way to drive off a cliff without breaking your neck or your wallet!